In honor of our 16 trends, let’s go back 16 years, when the world was very different. In 2000. The X-Files were on television, no one knew about al-Qaeda, and armies of pharmaceutical sales reps marched in and out of physicians’ offices, leaving trails of details aids and tchotchkes in their wake. Now, in 2016, The X-Files are back on television, but sales forces are signifcantly smaller than they were (even from 2007 to the first quarter of 2013, sales forces in the United States declined from 98,000 to 64,000 reps, and cuts continued in 2015). The industry voluntarily retired the ubiquitous pens, mugs, and other tchotchkes back in 2009. Al-Qaeda has been succeeded by Daesh. Paper detail aids have been supplanted, for the most part, by interactive digital presentations. And changes will continue to affect how pharmaceutical sales forces operate, Though some of the trends cited are more about what is happening with the customers – physicians and patients – pharma sales force strategies will be affected by these trends as companies react to realign and rethink how reps are deployed. 1. The number of sales reps has stopped declining. According to Pratap Khedkar, managing principal at ZS Associates, the number of sales reps may even see a modest uptick for the first time in years. The number of reps in the United States has bottomed out to around 65,000, 36 percent less than its peak in 2005. The modest increase in reps is expected because most of the major patent expirations are over and the number of FDA new drug approvals is growing. 2. Rep access will continue to decline as physicians change behavior (except maybe in certain limited cases). In 2015, the number of physicians pushing back against reps either to a moderate degree or a severe degree exceeded 50 percent, Khedkar says. “This means less than 50 percent are freely accessible,” he says. But David Stievater, director, strategic solutions, at athenahealth believes that there will be “modest growth” in the ability of pharma sales reps to gain time with physicians. This will be driven by the launches of new drug classes such as immunosuppressants and PCSK9 cholesterol-lowering agents. However, though there may be intense demand for information about these new products, the numbers of physicians interested in hearing more about them will not be enough to turn the tide against the trend of reduced physician access, experts generally agree. 3. Variable incentive compensation will become less variable. Although sales forces may modestly grow, as companies worry about compliance and reigning in extreme rep behavior and rewards, payout curves will flatten further, according to Khedkar. This means payout differences between low-performing reps and high-performing reps will shrink. 4. There will be continued growth of Key Account Managers (KAMs). This trend will be noticeable especially at pharma manufacturers that have been late to focus dedicated account teams calling on IDNs, ACOs, and large independent physician groups, Stievater says. 5. Customer experience will suffer even more and force companies to address the sales and marketing orchestration problem. As digital and non-personal channels proliferate, top physicians are hit once every hour by some industry channel, which leads to poor experience and engagement. “As awareness of the problem spreads, companies will be forced to address this issue through data-enabled orchestration – where upskilled sales reps use predictive customer analytics on their iPads to coordinate all touches a customer sees from a company,” Khedkar notes. “Non-traditional channels such as inside sales will continue to see increased use. 6. In conjunction with the growth of KAMs will be the launches of new “above the brand” programs to improve diagnosis and treatment. According to Stievater, this strategy will include partnerships with IDNs, pharmacies, and even payers. Increasingly, sales forces will need to look at the full patient disease experience and provide services beyond the drug itself. “This will not play out fully in 2016, but you’ve had glimpses of this with some of the programs that have begun with big health systems like Geisinger,” he says. In May 2015, Boehringer Ingelheim established a five-year partnership with Sutter Health to explore and test the value of digital health solutions, mobile technologies, and insights from advanced data analytics in the delivery of health care. In March 2014, Daiichi Sankyo Inc. and Partners HealthCare’s Center for Connected Health entered a joint-development agreement to create a mobile app to serve as a coaching platform for patients with atrial fibrillation who have been prescribed oral anticoagulation therapy. The goal of this mobile app will be to support patients living with atrial fibrillation by helping improve patient adherence and compliance to medication, as well as fostering feedback loops that connect the provider to the patient. Merck & Co. established a program with Geisinger Health System as far back as 2012. The multi-year collaboration is designed to improve patient health outcomes by focusing on innovative solutions that facilitate shared decision making between patients and physicians and improve adherence to treatment plans and clinical care processes. “The purpose of the work the pharmaceutical companies are doing with the health systems is around finding areas of common ground that are not about the brand names, specifically in the therapeutic area the drug operates in,” Stievater says. And in 2016, expect more pharma companies to announce partnerships with IDNs and health systems. 7. Companies will need to put more focus on justifying the expense of new specialty therapies. These devices, such as smart inhalers and injectors, can improve adherence and overall patient care by feeding patient data back to the pharma manufacturer, Stievater says. “Pharmaceutical companies are trying to get involved in the whole patient care [continuum], trying to get them to care for their condition rather than just taking a drug,” he says. 9. As local market variability worsens, companies move away from a “carve-out” approach to a systematic locally customized selling approach. ZS Associates experts say the United States is fragmenting into dozens of dissimilar markets as payer-provider power ebbs and flows city to city. “This increased customer complexity and heterogeneity require companies to move toward hybrid sales structures tuned for a locality instead of the one-size-and-structure-fits-all approach that has prevailed in the last two decades,” Khedkar comments. 10. Complicating local market variability is the launch of health plans by IDNs. “This is happening very quietly,” Stievater says. “They’re getting chartered by their state, and most of them are beginning with their own employees.” About 13 percent of health systems have launched their own health plans, according to athenahealth. This trend is forcing pharma companies to deal with an increasingly complicated payer landscape, Stievater says. On the flip side, health plans are increasingly becoming providers, creating another large institutional buyer on whom pharma must call. According to Stievater, United Health Group’s Optum unit employs directly and indirectly between 17,000 to 20,000 physicians. 11. Pharma will increasingly need to use “big data” from practice management systems, payers, EHRs and other sources. This data is needed to better understand the patient journey, and provide support for drug development such as better clinical trial recruitment, according to Stievater. Matthew Arnold, principal analyst at Decision Resources, says companies need to get their arms around advanced analytics, which will soon include cognitive technologies such as IBM’s Watson or Google DeepMind. 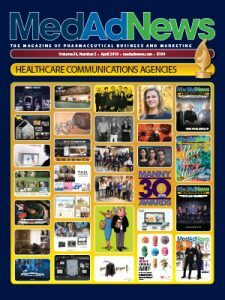 “This will allow for more sophisticated and dynamic marketing, like segmentation which considers cost, treatment pathway and experience preferences, along with channel optimization and contextual targeting through advanced behavioral support programs and remote care,” he writes with Monique Levy. 12. Pharma will have to explore pilots with patient portals from healthcare providers and EHR systems. These initiatives would be aimed at improving disease awareness/education, medical adherence, and access to patient assistance programs. With athenahealth’s portal, “There are all kinds of opportunities to include the care patient receives because it allows you to communicate with the patient,” Stievater says. But patients are using portals in a very limited way, mostly to pay their bill and schedule appointments. “I think we need to make our portal stickier, have it be a destination patients think to go to all the time,” Stievater says. “And I think that pharmaceutical companies, especially those who have chronic patients, there are ways to connect better with patients. … Pharma will try to find ways to insert itself, whether it’s through patient educational materials that it has or just general disease awareness, helping patients figure out how to take their meds. 13. Pharma should expect to conduct experiments with building tools into EHR systems. The aim of these tools would be to improve disease detection and adherence to treatment protocols, including the use of standardized APIs. 14. Marketing teams will be reducing the use of outside advertising agencies and other firms to handle strategic marketing activities. According to Stievater, more brand teams will be taking back full control over brand strategy and decisions on media mix, relying on agencies once again for creative, strategic input, and media buying. During the last cycle, this past decade or so, pharma companies not only relied on agencies for buying power, but for making decisions about the mix. Admittedly, this is all anecdotal, Stievater says, but he has observed this happening at four or five big pharma companies. 15. Pharmas will pull dollars out of DTC TV and plow them back into digital advertising, content, and services. 16. Physicians, like patients, will continue to rely on their smartphones and pharma will need to refine their techniques in reaching them. Nate Gross, co-founder of Doximity, says physicians are big Apple fans. The company sees 70 percent of Doximity’s usage on smartphones and tablets, with 90 percent of Doximity mobile users on Apple vs. Android devices. This is up from 85 percent in 2014. Of the physicians using Android devices, users are 35 percent more likely to be male than female and 50 percent more likely to be under 40 than their older counterparts. Dermatologists, orthopedics, and vascular surgeons are the biggest Apple fans. Part of being able to leverage physician usage of digital is knowing a doctor’s connection patterns, Gross says. These connection patterns differ by specialty and gender. For example, primary care physicians are slightly more local than specialists. Specialists’ networks tend to extend 40 miles further than primary care doctors’ networks. And the average male physician has more professional connections than the average female physician (74 vs. 57 colleagues, respectively); however, female connections tend to be 52 miles further than their male counterparts.